*** A note of thanks to Corey and Mike, for their patience, while I took a break after a very busy 2018!! Now that Jeanne and I have finally settled on Tucson, Arizona at least for a while, I will pick up where I left off at the end of 2018. Arizona, specifically the South East portion of the state, will be my “beat” for the rest of this year. I have lived most of my life in a desert of some form, be it the high desert areas of Oregon, to the more arid Southern Baja of Mexico, so I am truly amazed at the birding opportunities this area provides! Every day it seems, I get to learn about a new, and equally amazing location. So far, for me the crown jewel of the area is what I refer to as the “Madera Canyon Complex”. This incredible area is probably the best known area to birders, especially from outside this area and maybe worldwide. Now don’t get me wrong, I have only been here two months now, but have posted 114 eBird submissions, from nearly 40 different locations. My Pima County list for those same 60 days is at 186 different species, and over 40 of those came from the Madera Canyon area. I personally refer to the Madera Canyon area as a complex, due to both the varied habitats it provides, The difficulty in learning the area, as well as the nearby Florida Canyon that in many ways gets lumped in with the Madera Canyon. This area has no less than 17 eBird hotspots recorded, many of which boast nearly 200 species. The Proctor Road loop stands at 219, and the Lower Florida (Pronounced Flor-ee-da) Canyon is at 224. For today, I am going to try to cover just the Madera Canyon area proper, and save Florida Canyon for next week. Located approximately 40 miles south of Tucson, Arizona, you travel on Highway 19 to Green Valley, and exit at Continental Road. From there you go one mile and make a right at Whitehouse Road. The beginning of the Madera Canyon area is then 11 miles away, slowing gaining in altitude to 4500 feet at the first stop, the Proctor Road parking area. This is the beginning of the canyon, but makes a nice transition from grassland/sage brush mix to a more riparian, oak, juniper and sycamore habitat. This area also starts to have the first of the Hackberry Bushes, an important winter time food source for many species. Lesser Goldfinches, Black-tailed Gnatcatchers, as well as the rarer Black-capped Gnatcatchers can be found here. Western Bluebirds, House Wrens, Bewick’s Wrens, mixed flocks of sparrows including Brewers, Chipping, Lincoln’s, White-crowned, and an occasional Rufous-winged are all pretty common. From here there are several places to stop along the way or you can choose to walk the trail the follows the canyon floor the 2 miles to the Santa Rita Lodge. The next driving stop along the way would be the Whitehouse picnic area, followed by the Madera Canyon Picnic area. The eBird counts for these two areas are 167, and 186 respectively. Next in line is the Santa Rita Lodge is a pretty amazing area, known not only for it’s beautiful location and rooms, but large array of carefully maintained feeders that are open to the public to visit any time. 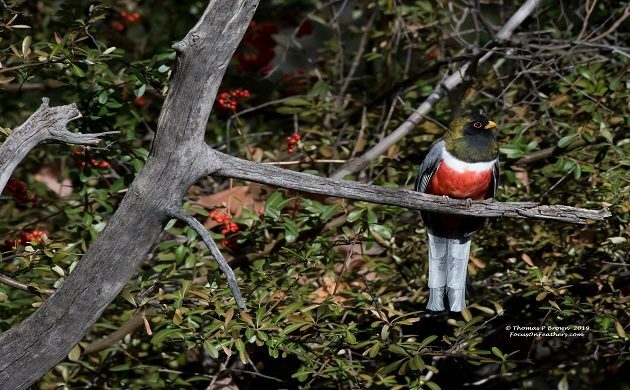 In the Madera Canyon Picnic area, the most famous resident, until these last few weeks has been the magnificent Elegant Trogon. 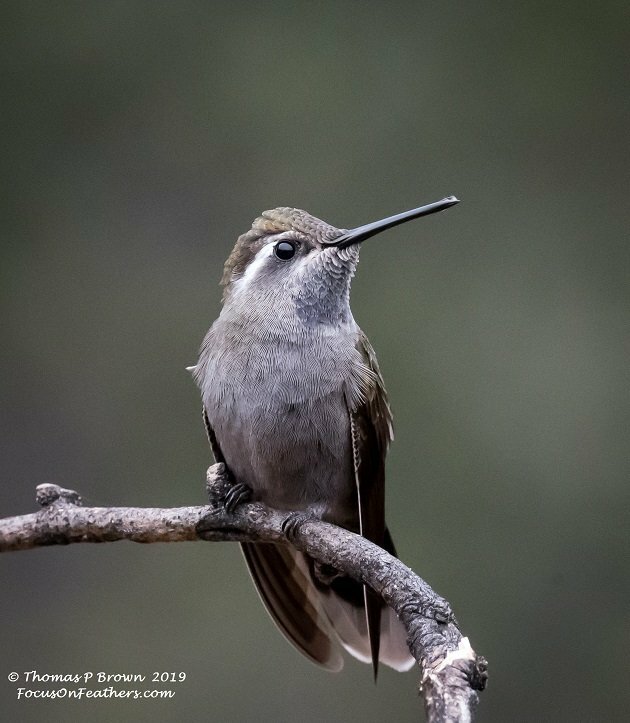 Famous for its tolerance of the large number of people that venture thru the canyon, this bird’s photograph is highly sought after by many birders from all over the world. 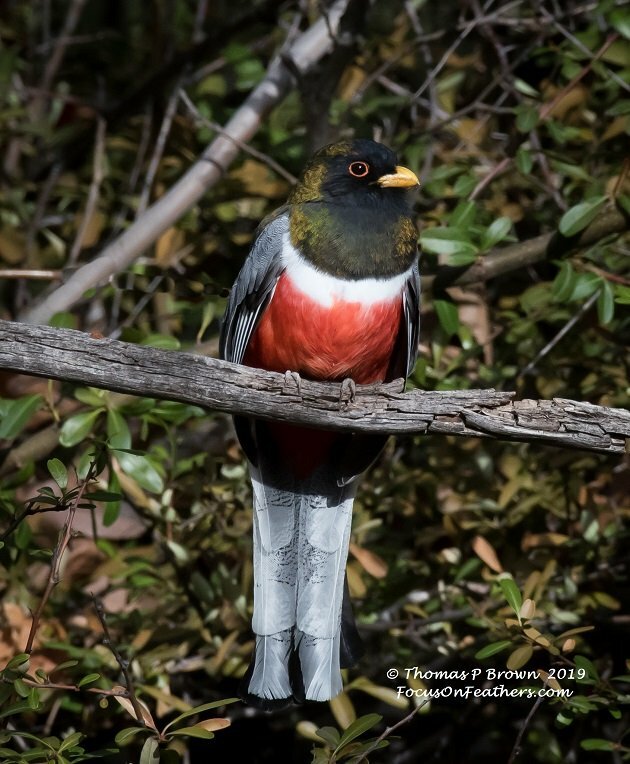 The fame of this resident trogon was diminished a bit, when right after the first of the year, a “first ever” for Arizona, White-throated Thrush showed up. This bird’s arrival sent ripples thru the bird world all across the country. Some days there were literally 100’s of people, wandering up and down the path, hoping for a chance to see this rarity. The financial gain from this bird is to my knowledge undetermined, but the trampled brush, broken tree limbs, and newly formed “trails’ in this pristine area will take years to recover from. The thrush fed on the few remaining Hackberries, along with the American Robins, and the always plentiful Hermit Thrushes for several weeks. About a week ago, the thrush, along with any sign of a lingering Hackberry, has disappeared. This is the famous White-throated Thrush. This picture was taken the second day it was spotted, on a cold miserable, snowy/rainy day. 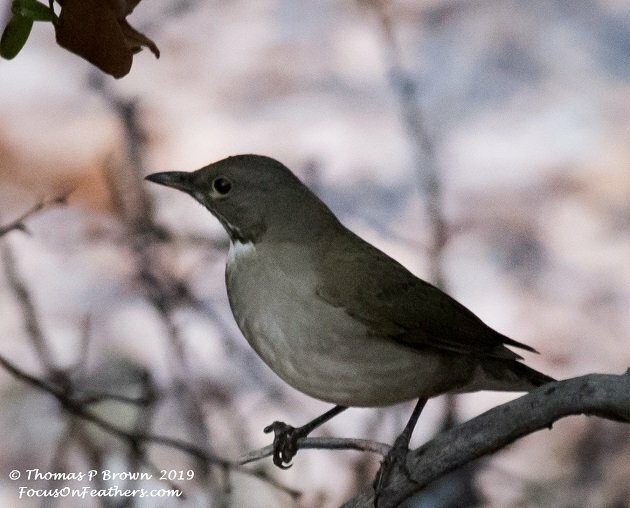 There are plenty of great birds to be seen in the canyon this time of year, even before the arriving migrants show up. White-throated Sparrows, three different species of Dark-eyed Juncos, Yellow-eyed Juncos, Painted Redstarts, Bridled Titmouse, Arizona Woodpeckers, Acorn Woodpeckers, Mexican Jays, Hepatic Tanager, Brown Creepers and Wild Turkeys just to name a few, are all quite common. 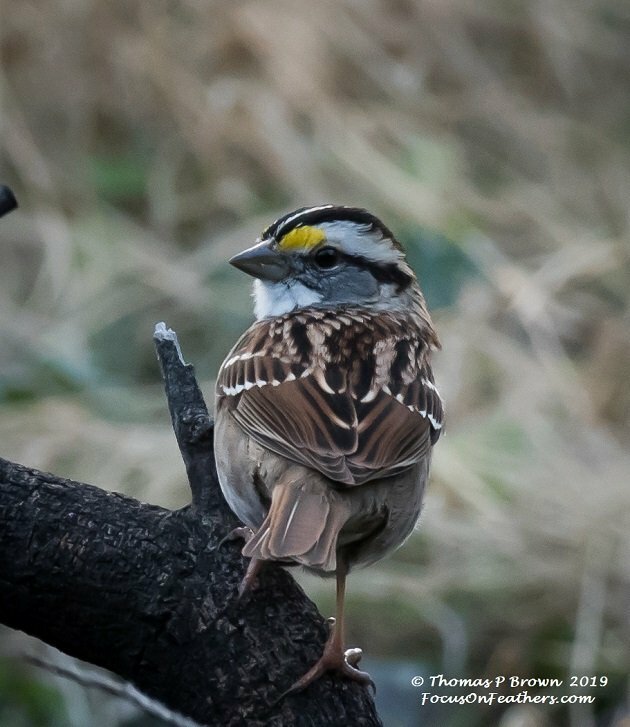 This is the wonderful White-throated Sparrow. The feeders at the lodge also attract some great hummingbirds, with Blue-throated, Broad-billed, Rufous, Anna’s, and Rivoli’s all being available thru out much of the year, just so long as the area’s Coatis have not emptied the bird feeders. 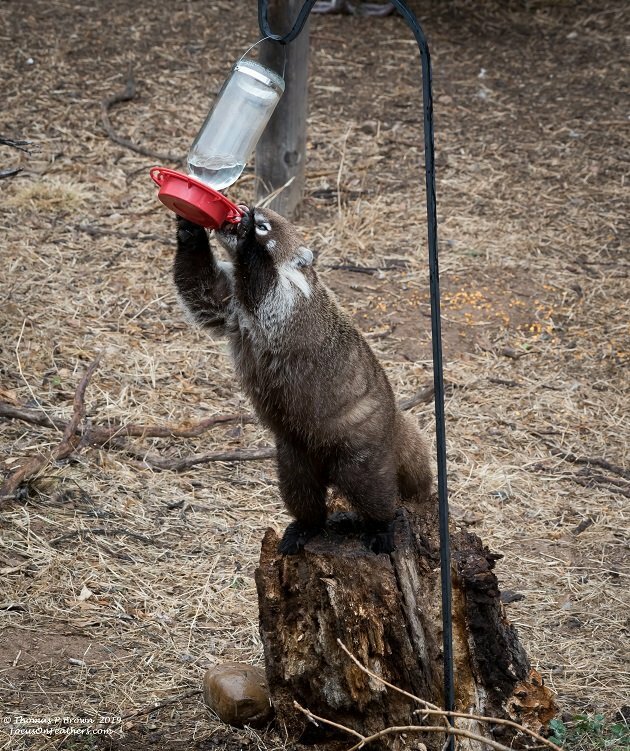 Here is a picture of that offending Coati, chugging the hummingbird food! This is a resident, but rare none the less, Blue-throated Hummingbird. I nearly forgot to mention owls, as the canyon has Elf, Whiskered Screech, Western Screech, and Ferruginous Pygmy-owls all in residence, although a few bail out and head to Mexico in the winter. 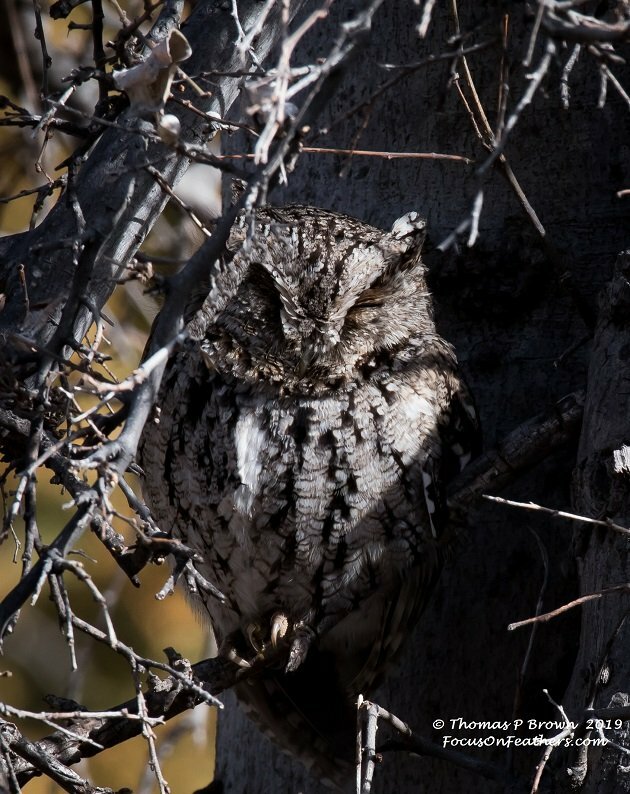 This Whiskered Screech Owl has its roost pretty close to the Proctor Loop Trail, so it gets lots of attention. 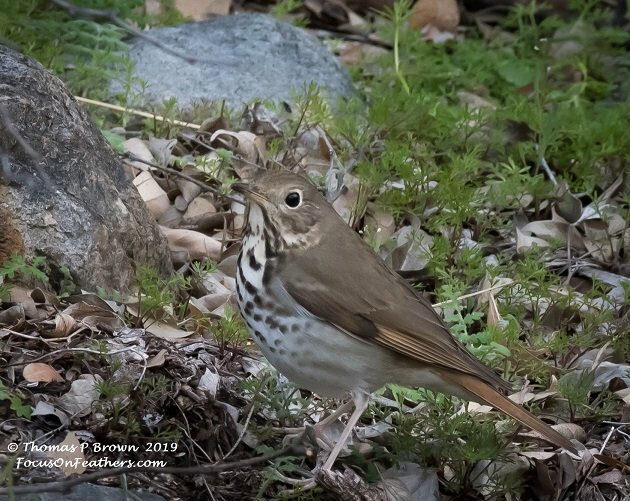 One of the most common birds in the canyon, the Hermit Thrush is such a beautiful bird. As the migrants start to wander in, I will continue to keep you updated on these as well as the many incredible hot spots that southern Arizona have to offer. my abiding memories of Santa Rita Lodge were the Acorn Woodpeckers that hammer their supplies into the wooden window frames in the lodge and the Elf Owl in the telegraph pole. Not much beats birding in SE AZ. Have you visited the Arivaca Cienega Trail at the Buenos Aires National Wildlife Refuge? I saw Lawrence’s Goldfinch and Gray Flycatcher, both lifers, on my single visit. This place really is amazing! I have been down there a few times, but already have both those birds this year. The Gray Flycatcher, a couple of times, but especially up in Florida Caynon. The Lawrence’s Goldfinch is at several spots around Green Valley, but the biggest number I have seen (57) was at Canoa Historic Ranch and lake. No sign of the Elf Owl yet, just a little too cold for them, but the endless supply of Acorn Woodpeckers are there for sure! The Boreal Owl Murder… Free!